At the invitation of State Councilor and Foreign Minister Wang Yi, Minister of International Affairs and Cooperation Unity Dow of the Republic of Botswana will pay an official visit to China from July 12 to 14. The Foreign Ministry and the People's Government of the Hubei Province will hold a promotion event in the South Building at 3:30 pm on July 12 (Thursday), presenting Hubei Province to the world under the theme of "China in the New Era: Hubei, from the Yangtze River to the World". State Councilor and Foreign Minister Wang Yi will deliver a speech at the event. Secretary of Hubei Provincial Committee of the Communist Party of China (CPC) Jiang Chaoliang and Provincial Governor Wang Xiaodong will also make remarks and representations. Foreign diplomatic envoys are invited to speak and interact with all the guests. Hubei is the place where the Yangtze River civilization originated and gets passed on. In recent years, through fully leveraging its geographic advantage of being located along the Yangtze River which is known as the "golden waterway", Hubei has been making positive efforts to transform itself into a shining example of opening-up among all inland provinces, an engine for high-quality development in the Yangtze River Economic Belt, and a crucial juncture connecting the Yangtze River Economic Belt and the Belt and Road, thus laying out a blueprint for Hubei Province to march onto the world stage from its home along the Yangtze River. We believe that this promotion event will present a charming Yangtze River to the world and showcase a new Hubei, full of vitality, opening its arms to the outside world. We look forward to seeing your participation in and coverage on this event. Q: It is reported that the third meeting of the 21st Century Panglong Peace Conference will be held in Myanmar on July 11. Will China send officials to attend the event? A: At the invitation of the government of Myanmar, Sun Guoxiang, Special Envoy of Asian Affairs of the Ministry of Foreign Affairs of China, will attend the third meeting of the 21st Century Panglong Peace Conference. China always supports Myanmar in advancing the peace process as well as the efforts made by all relevant parties to achieve Myanmar's peace and national reconciliation. We hope that all relevant parties in Myanmar can stay committed to peacefully resolving differences through dialogue and negotiation, secure a nationwide ceasefire at an early date and create enabling conditions for the enduring peace, development and prosperity in Myanmar. We hope that the third meeting of the Panglong Peace Conference will achieve success and facilitate positive progress of Myanmar's peace process. We stand ready to continue to play a constructive role in Myanmar's national reconciliation and peace process in light of the willingness of all relevant parties. Q: We have noted that Premier Li Keqiang, who is now on a visit in Germany, co-hosted the 5th round of China-Germany inter-governmental consultation with German Chancellor Angela Merkel. Chancellor Angela Merkel said that the German side opposes trade war, stands for the rules-based free trade and is willing to step up cooperation on opening up with China and jointly send out the positive signal of upholding multilateralism and conducting international cooperation. The German side is glad to see that the measures announced by China on expanding the opening-up have been firstly implemented in Germany-China cooperation, commends the steps taken by China to further open up the financial market and welcomes the Chinese enterprises' investment in Germany. The German side supports the China-EU Summit in releasing a joint statement and will strive to make the negotiations on EU-China investment agreement achieve positive progress at an early date. Does this mean that China and the EU have more consensuses and common interests in upholding free trade and multilateralism when the current global trading system is confronted with multiple uncertainties? A: On July 9 local time, Premier Li Keqiang co-hosted the 5th round of China-Germany inter-governmental consultation with Chancellor Angela Merkel in Germany. This round of consultation is the first all-round communication between the relevant departments of our two newly-elected governments, which is of great significance to chartering the course for and advancing the all-dimensional cooperation between our two countries. During the consultation, fruitful outcomes have been achieved in a wide range of areas. The two sides agreed to strengthen all-round strategic cooperation and jointly send out the signal of firmly upholding multilateralism and free trade with concrete actions. The two sides will move forward bilateral economic and investment cooperation, jointly uphold free trade and an international market based on fairness and universally acknowledged rules, open wider to each other and relax market access. China is willing to explore third-party markets with Germany. The German side stands ready to leverage its own strength to carry out cooperation with China on "Industry 4.0". China supports setting up Frankfurt financial center and the RMB offshore market, agrees to confer the underwriter qualification for non-financial corporate debt-financing instruments to Deutsche Bank. The two sides have for the first time reached the agreement on increasing the share of German automobile companies in the jointly invested projects in China and the establishment of large projects wholly funded by German chemical enterprises in China, which demonstrates that the string of concrete measures taken by China to expand opening up are being implemented. When holding the joint press conference with Chancellor Angela Merkel, Premier Li Keqiang said that in the upcoming new round of opening up to the outside world, China will continue to optimize its market environment and strengthen the intellectual property rights protection. Germany is welcome to seize the opportunities provided by China's new round of reform and opening up. China and the EU are two important forces and two major markets in the world as well as important members of the World Trade Organization. This year marks the 15th anniversary of the China-EU comprehensive strategic partnership and the 20th anniversary of the mechanism of the China-EU Summit. The 20th China-EU Summit will be held in Beijing in a couple of days. Currently, unilateralism and protectionism are on the rise, which undermines international rules and threatens global economic recovery and growth. Against this backdrop, China and the EU both have the willingness to strengthen strategic communication and coordination, build consensus and uphold free trade, multilateralism and the international order with concrete actions. China looks forward to working with the EU to ensure that the upcoming 20th China-EU Summit can reap fruitful outcomes, promote the steady and further development of China-EU relations and send out the positive signal of jointly upholding multilateralism, advancing trade and investment liberalization and facilitation, addressing global challenges and maintaining world peace, stability and development. This is also the responsibility that China and the EU should assume as two major forces. Q: According to reports, Jeremy Hunt who previously served as the Health Secretary will replace Boris Johnson as Secretary of State for Foreign and Commonwealth Affairs, and former Housing Minister Dominic Raab will replace David Davis as the head of the Department for Exiting the European Union (DexEU). What is China's comment? A: We have noted these developments inside the UK. I want to stress that now China-UK relations are enjoying a sound momentum of development. No matter what happens inside the UK, China will continue to value its ties with the UK and work with the UK to move forward bilateral relations. Q: The 8th Ministerial Meeting of the China-Arab States Cooperation Forum (CASCF) opened up today in Beijing. President Xi Jinping attended the opening ceremony and delivered an important speech. What is China's expectation for this CASCF meeting? A: This morning, the opening ceremony of the 8th Ministerial Meeting of the China-Arab States Cooperation Forum was held at the Great Hall of the People in Beijing. President Xi Jinping attended the opening ceremony and delivered an important speech titled "Joining Hands in Advancing China-Arab States Strategic Partnership in the New Era", announcing that China and Arab countries have agreed to establish a future-oriented strategic partnership of comprehensive cooperation and common development. This marks another major development well worth celebrating in the history of China-Arab States relations. President Xi Jinping said that China and Arab States are good partners working for mutual benefit and good brothers sharing weal and woe. China's Belt and Road Initiative has seen wide support and active participation from the international community, including from Arab States. Sitting at a geographic juncture of the Belt and Road, Arab states are natural partners for the Belt and Road Initiative. The two sides should work to combine the Belt and Road Initiative with the regional conditions, collective actions with bilateral cooperation, and promoting development with upholding peace, so that the two sides could draw on each other's complementary strength, achieve win-win results and deliver more benefits to people in the region and around the world. The China-Arab States relations have been promoted in an all-around way through cooperation on the Belt and Road Initiative, and China-Arab States comprehensive cooperation has entered a new stage. China stands ready to work with Arab States to further align strategies and actions and move forward the Belt and Road cooperation. Together, China and Arab States will be guardians of peace and stability, champions of fairness and justice and drivers of common development in the Middle East, and we will remain good friends who learn from each other. Over the past 14 years since its inception, the CASCF has been growing in both scale and significance, offering a strong boost to the collective dialogue and cooperation between China and Arab States. The past four years have seen frequent senior-level exchanges, a strengthening of political mutual trust, and a high-level running of bilateral relations, as marked by President Xi Jinping's successful visit to the Middle East and the visits by heads of states of Egypt, Saudi Arabia, Morocco and Palestine. This morning's speech by President Xi Jinping at the 8th Ministerial Meeting of the CASCF is his third policy announcement towards the Arab world, demonstrating the great importance and support China attaches and lends to the development of China-Arab States relations and the CASCF. President Xi Jinping shared his important perspectives on strengthening the top-level design for China-Arab States relations, planning for collective cooperation and guiding the development of the CASCF, which we believe will chart the course and provide fundamental principles for the growth of China-Arab States relations in the new era. Some of the forward-looking, innovative and pioneering propositions that President Xi Jinping raised on strengthening China-Arab States cooperation under the Belt and Road will also usher in a new chapter on this front. 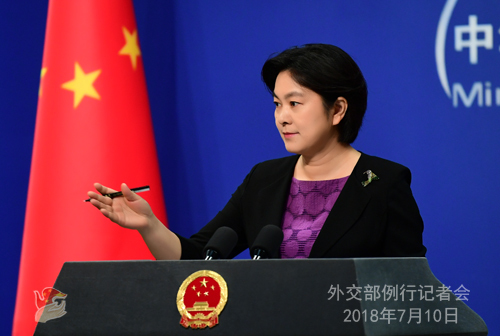 We are convinced that with the concerted efforts of the two sides, the 8th CASCF Ministerial Meeting will achieve a full success, injecting new impetus of development into China-Arab States relations, opening up new horizons for China-Arab States cooperation, and bringing new hope of peace to the region. 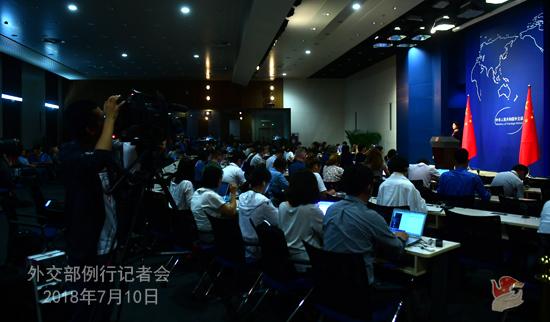 Q: US President Trump tweeted yesterday that China may be exerting negative pressure on the DPRK because of its trade issues with the US, and this may be the reason behind the DPRK's recent criticism on the US. Do you have any comment? A: I have three points to make. First, China's position on the Korean Peninsula issue is consistent. Second, China's attitude on the China-US trade issues is clear. Third, China is a trustworthy and responsible major country. Q: The Hangzhou Intermediate People's Court sentenced a Japanese man to 12 years in prison on spying charges. Do you have more information? How will it affect China-Japan relations? A: I am not aware of this situation. China is a law-based country. The relevant department will handle this case and ensure the legal rights and interests of foreigners in accordance with the law. I believe that diplomatic relations will not be affected by lawful and impartial handling of an individual case. Q: According to reports, on July 9, Thai Prime Minister Prayuth Chan-ocha pledged to make all-out efforts in the ongoing search and rescue operation and get to the bottom of the accident when visiting the command center for the search and rescue efforts regarding the boats capsizal accident off Thailand's Phuket island. However, a Thai official blamed the accident on the Chinese tour operators because the travel agencies insisted on letting the boats set out to sea despite the warnings of bad weather issued by the meteorological department. What is your comment on this? Are you satisfied with Thailand's handling of this accident? Have you asked the Thai side to shoulder the relevant responsibility? A: With regard to the boats capsizal accident off Thailand's Phuket island, as of 1 p.m. July 10, 75 people have been rescued, 44 lost their lives and three are still missing. Since the accident happened, China and Thailand have been conducting close cooperation in the search and rescue operation and follow-up matters. The Foreign Ministry, China's diplomatic missions in Thailand and the joint working group of the Chinese government remain in close communication and coordination with the Thai side. We have asked the Thai government and competent authorities for their best efforts in locating the missing, treating the injured, finding out the cause of the accident, and making proper arrangements for follow-up matters. Since July 7, the Thai side has in total dispatched more than 60 ships, flown over 40 flights and sent nearly 100 frogmen and volunteer divers and 1,000-strong military forces in the region to patrol and engage in the search and rescue efforts around the clock. Moreover, the searching area has been expanded to the waters off Krabi, Phang Nga and Trang in light of the movement of ocean currents. The Thai side promised that their search efforts will not cease until every missing Chinese tourist is found. Yesterday, Thai Prime Minister Prayuth Chan-ocha was at the scene to guide the search and rescue work. He met with Chinese Ambassador to Thailand Lyu Jian and the joint working group of the Chinese government. They later visited the injured Chinese tourists in hospitals and expressed their condolences to the bereaved families. Prime Minister Prayuth Chan-ocha said that Thailand and China share brotherhood and the Thai side will spare no efforts to search for and rescue the missing, properly handle this accident, treat the injured Chinese tourists and the bereaved families as their own family members, go all out to provide assistance and facilitation and make proper arrangements for follow-up matters. The Thai police will find out the cause of the accident as soon as possible and figure out the parties who are to blame for the accident and hold them accountable with no tolerance. The Thai side will learn a lesson from this accident to take concrete measures to better ensure the safety of tourists, beef up security checks on ships and improve the maritime early warning mechanism. The Thai side is willing to step up cooperation on tourist safety with China, provide a safer environment for Chinese tourists traveling to Thailand and prevent a recurrence of such a tragedy. 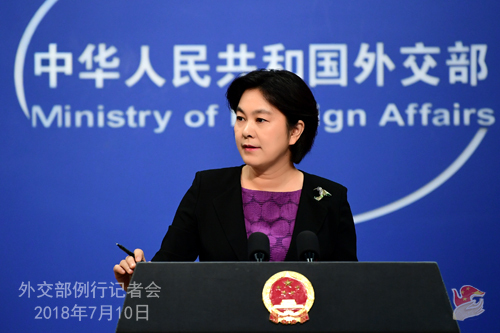 The Chinese side will continue to join hands with the Thai competent authorities to make utmost efforts to search for and rescue the missing and deal with the follow-up matters, offer assistance to the Chinese tourists involved and their family members so as to ensure and protect the legitimate rights and interests of the Chinese citizens.